Did you read your forum to see the new bugs introduced by this version???? If you read it, did you correct them? Can you share with us the link describing those bugs ? For language problem, we have fixed it. Seagate utility problems is solved in 2127 version. When we have support to read write rom from samsung 2.5" (fails in m7e) ? actually more important when we can edit head map in ram on those disks,we must have this function to resolve cases. Sir, please find below picture, our software can support what you say, please double check. I don't know about this very old HM321HI,but we get often HM501II,HM641JI and I tried many good ones on all of them this function don't work,and I post here after no attention from mrt technical support or customer service. Does MRT support Corsair F120 SSD ? Hi, can you take us a photo of the label and tell me the master controller version? You see,also you ignore the problem,you don't know it's not working ? why always give evasive unclear answer to customers ? can he fix mrt software bugs by remote ? Here is another model can't read rom and can't edit head ram. Why does the software not use the drive's own FIT rather than "the default module list"? The Err in the "Get part number" line would suggest that the software may be accessing the wrong SA module or incorrectly parsing the correct module. What does a resource dump look like? Hi, just contact Skype live:service_5567 let technical support remote check for you. If you already mentioned this I can tell you mrt software has "moods" with the same disk one time there is error and one time there is no error it's happened to me many times with different good disks,perhaps mrt can explain this behavior. I did not find a resource dump in mrt. Here is a screenshot of the same disk. The HDD in your latest example manages to load its own FIT, which then allows it to find the part number in the SA. This would suggest that the HDD in your earlier example was faulty, at least in this respect. That said, MRT's examples also have this "problem". 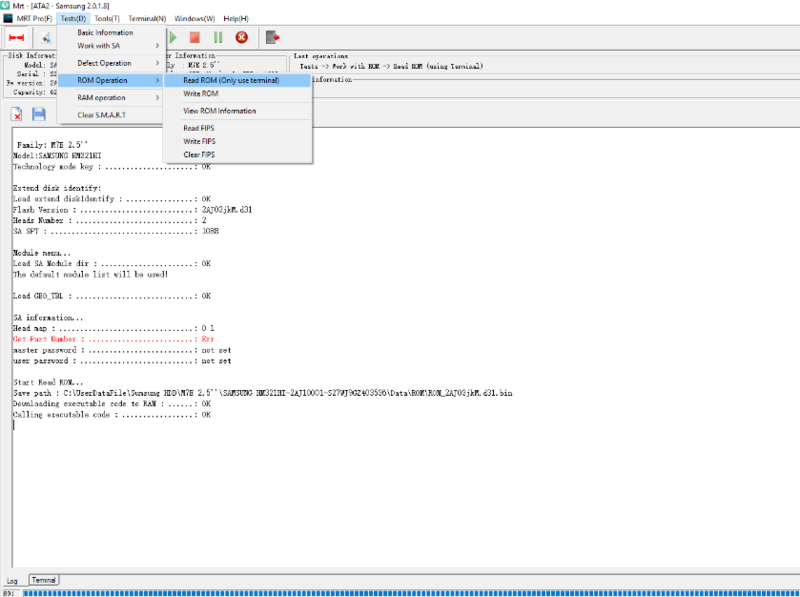 AIUI, MRT's software downloads code into the drive's RAM via terminal, and this code then executes various functions such as a ROM dump or head map edit. Is it possible that the serial adapter is flaky? Is there a debug mode where you can log the traffic on the terminal port? Look at the screenshot before the previous one it's the same drive 100% functioning and with error and the same happen on other good working drives,now look at the third time on the sams drive it's with error again,so one time error the second time in another day it without error then third time with error and so it goes on with other drives. 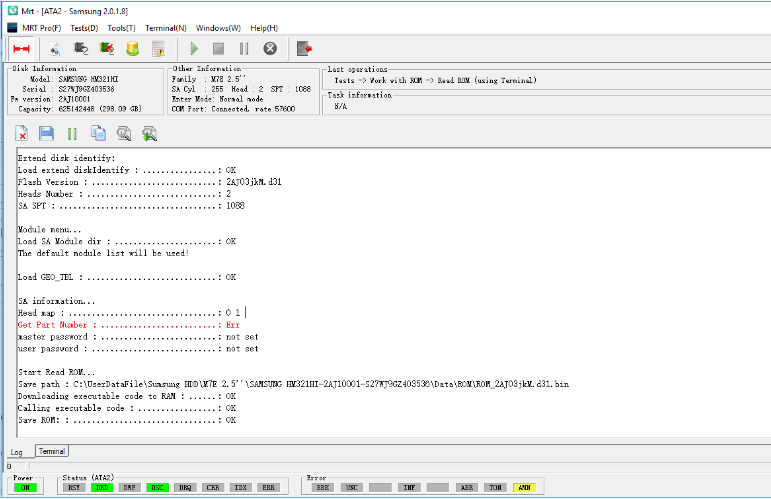 When I wrote "debug mode", I was asking whether there was a way to capture the Tx/Rx traffic over the serial port for debugging purposes. When MRT failed to load the drive SA module dir, and using default module dir, close utility, and open it again. Sometimes the MRT utility does not get enough time for the drive to gain access to SA module list (FIT), and the utility jumps out this important step, and uses "default module list".